EarthSoft recommends an experienced SQL Server Database Administrator install the Supported Microsoft SQL Server Edition prior to creating an EQuIS Database. Microsoft SQL Server Management Studio, although not required, may be useful when working with EQuIS Professional. Note: When installing SQL Server Express, a password must be provided for the SA (System Administrator) account. This is not the same as the computer administrator password. SQL Server has an account named sa that is the default system administrator account. This account, and any beginning with the characters '##', are explicitly excluded from creating new EQuIS Databases. 2.Connect to a SQL Server with the user and password combination created during the installation of SQL Server. 3.The next steps vary depending on whether there is any EQuIS Database present on the server, and whether any EQuIS licensing is available. 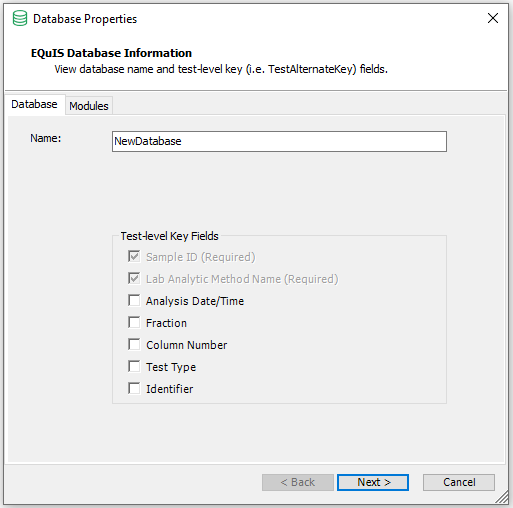 a.If local EQuIS keys are available and no EQuIS database exists on the server, the Database Properties window opens for configuring a new database. 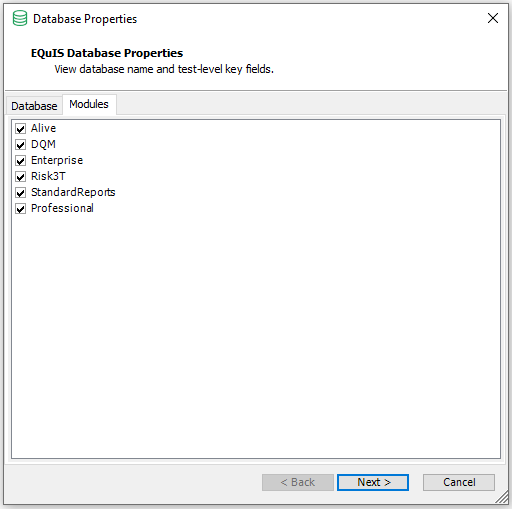 b.If a licensed EQuIS Database(s) exists, right-click on the database row and select + Create New from the context menu to open the Database Properties window. After the new database is created, it will require separate registration. c.If no EQuIS licensing is available, a registration prompt appears. Follow the instructions for applying local Workstation keys (Network keys are not an option at this point since they are associated with the not-yet-created database). After registration succeeds, the Database Properties window opens for configuring a new database. 5. Choose the Test Level Key Fields to be applied to the database. 6. Select the Modules tab to review the schema modules and edit selections as appropriate. The basic standard EQuIS Schemas are: Professional, Enterprise, and Standard Reports. Schema modules are found in the ./db/ sub folder of the application (typically: C:\Program Files\EarthSoft\EQuIS\db\ or C:\Program Files\EarthSoft\Database6\db\). 7.Select Next to create the database. Once processing completes, the new database will appear in the database list. •Any administrator will be able to log in using EQuIS Professional. To enable non-administrator user access to EQuIS Professional, an administrator will need to create a login for that individual (typically using Application Level Security). •The + Create New option will be unavailable if EQuIS Professional is running in an evaluation mode. In order to configure a new database, obtain a permanent license. •If the + Create New button is unavailable with permanent licensing in place, be sure that the database user has the SYSADMIN and DBCREATOR server roles assigned. The script below may be used (in Microsoft SQL Server Management Studio) to determine if the roles are correct. •When creating a new database and choosing to exclude Enterprise or the Standard Report Module, an Invalid object name error message will occur. The three schema are designed to create a relational database and are dependent on one another. To exclude one or more will result in an error. In a future iteration of EQuIS Professional, the two main schemas for EQuIS Professional and Enterprise will be merged, and this error will no longer occur. When creating a new database in SQL Server, EQuIS Professional issues the T-SQL statement shown below. EQuIS does not use the COLLATE option. As described in the SQL Server online documentation. If COLLATE is not specified, the database is assigned the default collation of the instance of SQL Server. The EQuIS Database will be created using the default collation of the SQL Server instance. To create the database with more specific options (collation, file groups, etc), do so manually in SQL Server Management Studio. EQuIS Professional will first look to see if the database with the given name already exists, before creating the schema. If the database already exists, the schema will be created in the given database. EQuIS cannot currently be used with a case sensitive collation in SQL Server. To create the database in a specific location or with advanced settings, create an empty database manually. In the steps above, enter the name of an existing (empty) database, and the EQuIS structure will be created within the existing database. A facility may comprise a group of sub facilities within an area of management or jurisdiction. During Facility Creation, additional information may be added (e.g. facility manager, address, phone or email). Additional facilities may also be added by clicking the Add... > DT_FACILITY button when viewing the DT_FACILITY table. 2.Connect to a SQL Server Management Studio instance with the user and password combination created during the installation of SQL Server. b.If a licensed EQuIS Database(s) exists, right-click on the database row and select + Create New from the context menu. After the new database is created, it will require separate registration. c.If no EQuIS licensing is available, a registration prompt appears. Follow the instructions for applying local Workstation keys. (Network keys are not an option at this point, since they are associated with the not-yet-created database). After registration succeeds, the Database Properties window opens for configuring a new database.